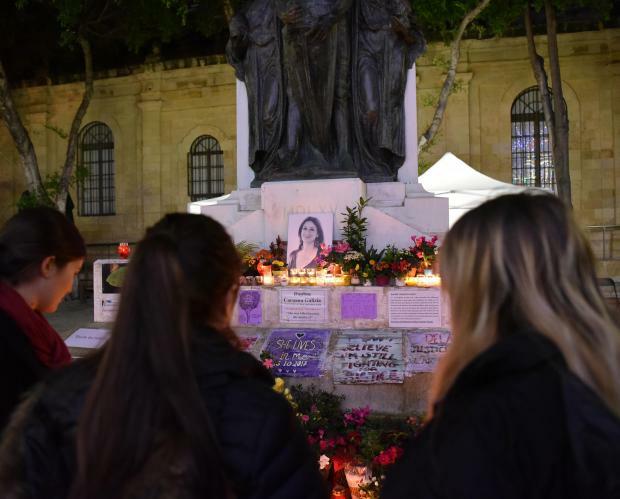 The Civil Society Network has requested the Valletta police to protect the makeshift memorial dedicated to assassinated journalist Daphne Caruana Galizia. The memorial located in Great Siege Square in Valletta was erected by the people for the people and should therefore be respected and protected, the pressure group told Police Commissioner Lawrence Cutajar through a letter shared with the media. "In a free world, in moments of national tragedy, it's a tradition for people to express their shock and their duty towards democracy by placing flowers and similar objects in prominent places, especially national monuments," the network said. The placing of flowers, messages and photographs around the Great Siege monument reflect the fact that the Maltese public is doing its duty. The letter comes after the network said it was appealing to Valletta council to recognise the makeshift civil shrine dedicated to Ms Caruana Galizia. It said some Valletta Labour local councillors intended to propose a motion which would see the removal of the shrine. Valletta 2018 foundation chairman Jason Micallef has objected to the memorial, and a controversy was whipped up after a video clip emerged of a woman who used a stick to clear floral wreaths laid at the site in front of the law courts. The victim's sister Corinne Vella accused Mr Micallef of spending hundreds of thousands in taxpayers' money on "vanity projects cluttering up a public square", but then objected to flowers laid in memory of a woman who "held him and his corrupt patrons to account".